← Stuffs of great joy, slow cooker, sorrel, quince, fermented lemons, oh My! I use the easy on the hands method of krauting. I use the food processor. Hooray for the food processor! My poor hands really appreciate it. NEHoo, I shred the cabbage (and whatever else might need shredding, ginger, apples, for example) and add appropriate salt (I use a cupped palm full *probably a tablespoon* for every head of cabbage.). I also add some ferment juice from another batch that I opened (see picture below, label well! :}) then let it sit for a while, then jam in the fido jars. I get them at my local Kroger grocery store, but they can be found on line, or even at TJ Maxx sometimes. In the wintertime I have a secret cabinet where I keep my science warm with a light bulb, or else its too cool in the house for the fermenting to happen. Picture of secret fermenting closet to come. Below are some of my ferments. I did not get a fresh picture of the one I did with the cranberry recipe, only I used 1 head of red cabbage to each 2 heads of green. its pretty and purplely/pink, which is what makes stashing that in the cosmic cranberry kombucha bottle a little tricky :} note to self, get a picture of the ferments in the cabinet. I also did not take a picture of the ginger/lime leaf kraut. It was not visually more spectacular than usual. I tend to eat warm leftover meat with cool kraut. I dunno, stanky breakfast makes me glad! My beloved is not a person who would tell you he liked kraut AT ALL (except that it makes me glad, so that makes him glad, but voting no eating, please and thank you!) but! He does enjoy it in savory “salads”, like a chicken salad or an egg salad in place of the pickles. Honestly the tart pop of the crans in the cranberry kraut really has captured my heart! 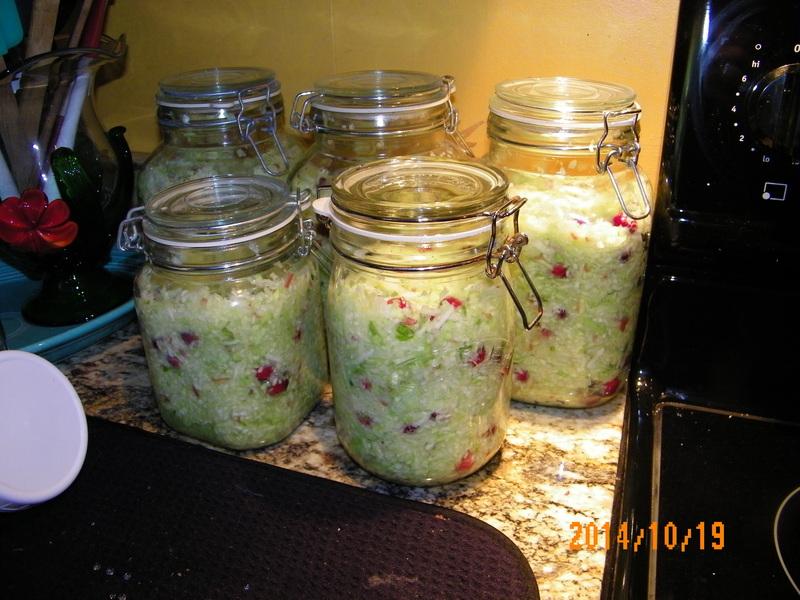 I have a hard time making any batches of kraut (during this cranberry plenty season) without them! The pomegranate seeds loose their lovely luster, so its amazing lovely at first like below, then visually its just kind of meh. Hopefully the taste will make up for it! Pretty! Delicious? We shall see! Cranberry, green cabbage, honeycrisp apple. YES TO DELICIOUS! 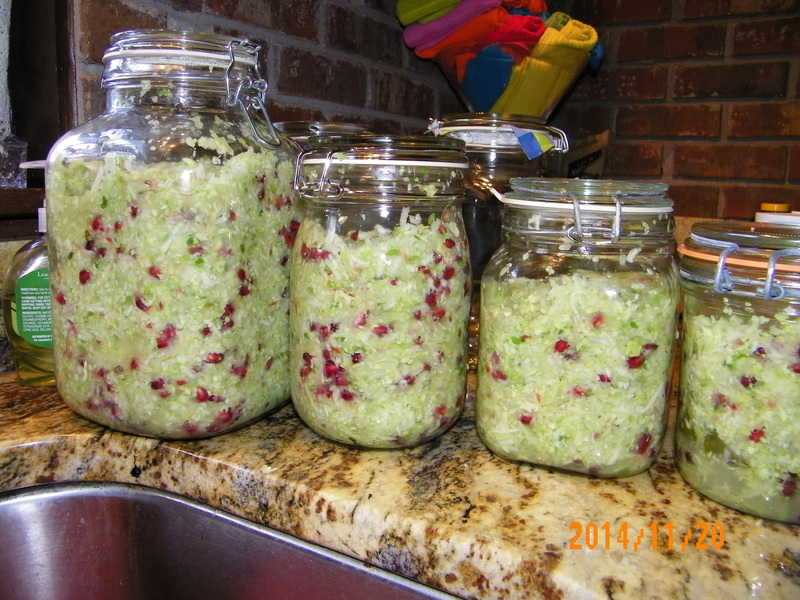 Actually, this season I am hoarding all the crans and making all my empty jars full of this recipe. 1 honeycrisp to each 2 heads of cabbage. 1 bag of crans to each 2 heads of cabbage. 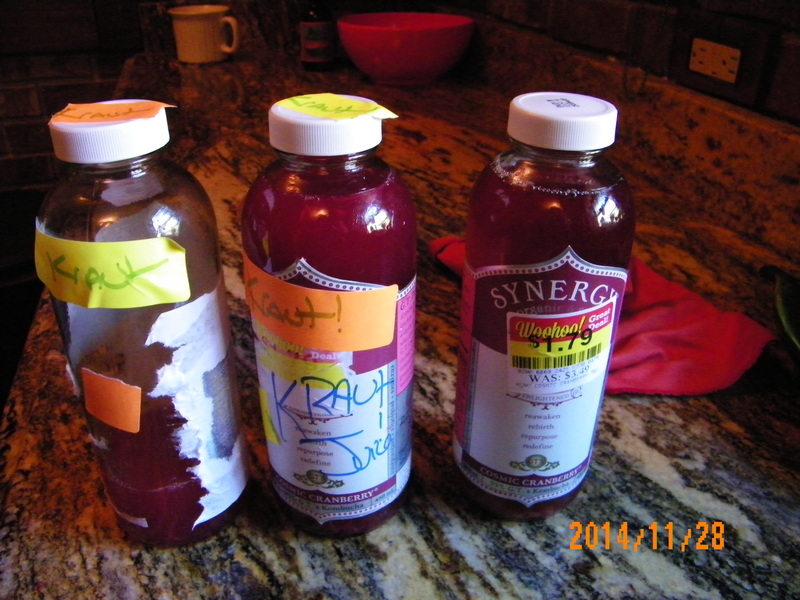 Make sure if your ferment looks like cosmic cranberry booch, that you label it! That would be a trixy trick!